A recent report has revealed that the Northern Territory’s capital city is the best place to go for people looking for work, with more job vacancies than unemployed people. Australia has enjoyed enviable economic stability in recent years thanks to its burgeoning construction and mining industries. While much of the prosperity has been centred in Queensland and Western Australia, the Northern Territory is now making its mark as a great destination for those looking to move to Australia. 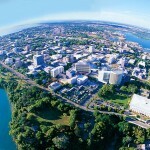 Jobs website Adzuna, which conducted the research, said there had been 130,000 jobs advertised nationwide in the construction and finance sectors alone so far this year and while Brisbane and Sydney remained popular options for jobseekers, Darwin was quickly becoming an employment hotspot. The average wage on offer nationwide for positions in the construction industry is currently AU$77,711 (£49,084) but the Adzuna survey found similar positions in Darwin offered AU$92,144 (£58,208) on average, an almost 20% difference. Darwin’s remote location and harsher climate have deterred workers in the past and subsequently drove wages up. With construction and mining beginning to stabilise in Western Australian and Queensland after a sustained period of rapid expansion, Darwin looks set to capitalise. It’s still a pretty expensive place to live though so this should be taken into consideration when looking at the salaries available in this region.